alienware AW3418DW Availability in the UK? Discussion in 'Monitors' started by Bodster, Jan 25, 2018. Well I still haven't gotten around to buying this, and I've just had an email alert from Camel, the Acer X34P is now £680 @ Amazon. For essentially the same monitor I can't really ignore that, can I? That is a good price for the X34P, only slightly beaten by some price last november. Well I've ordered the X34P, arrives tomorrow, although it'll probably be Friday before I get a chance to install it, lets hope I won the panel lotto! Well, the X34P has arrived and I've set it up. I'm happy with it for the price I paid. I have the usual bottom left back light bleed that most people get, but honestly I've tried a few games and its barely noticeable in use, you only see it during bleed tests. I was going to take a photo, but the camera on my phone makes it look 1000% worse than it is. The photo even shows significant bleed in the top right, which I'm just not seeing myself, it looks fine there. I think if I'd paid the full £1000 I might be tempted to send it back due to the bottom left, but I think I'd only get sent more of the same, or worse, so for the £680 I paid I'm going to hold onto it and play around with some of the settings. Such is the process of PC upgrades! I will say though although I’ve had to drop some settings on most of my games my 1080 is still giving me acceptable FPS. Apex Legends I’ve capped at 100 and it mostly stays there but that’s not a hugely demanding game. BFV I dropped most settings from Ultra to very high and cant even see a difference. FPS is around 70-85 which works. Division 2 is a struggle to maintain 60 FPS but the G-Sync really helps out there so it plays smoothly. I get the impression D2 isn’t that well optimised as D1 ran far better. How do you guys think this one compares to the LG? Having native Gsync and buying from dell for their excellent returns policy and warranty makes me edge towards this one. Any hints or tips on negotiating a decent price with them? I work for the NHS so I think I can get 10% off but I'd ideally like to knock off a hundred or so too..
Having played about with my X34P I've changed my stance from 'relatively happy' to 'very happy'. After browsing forums and looking at other photos it would appear that what I have is actually slight IPS glow, rather than backlight bleed, and even then its minimal compared to some I've seen. Its also one of those things thats notice during a test, but isn't during use, and infact I never would have spotted it without the backlight bleed tests. When I think back I've no idea if bleed/glow was an issue on my old monitor, as I never tested for it, I just used it. How is your white uniformity and also uniformity on dark colours, for example this forum... Do you notice any dark patches or other problems? Does anyone honestly have a X34P or Alienware, which does not have some sort of uniformity issues, such as darker on the right? I have yet to see a picture of one, that does not have this... Except for a picture I saw which was about 100% brightness so was such a bright white that you could not see. Is this to be expected with these monitors? Or is it actually possible to get one with close to perfect uniformity? They all seem to have a darker or warmer patch on the right? Also some vertical banding on darker colours such as this forum? So you do not have a panel which is darker (lower brightness) or warmer (yellow) on the right or left? Usually it is the right... I googled this and about 100 images of people with same problem, some people saying they had 3 with same problem etc. I have seen 1 or 2 which look ok. Can you post a pic of yours on a white screen? Also what brightness do you use? Trying to find out if they all have this, or if it is possible to get one without it. Could be the newest revisions are fixed for this I do not know! Would be happy to post a photo, where do people host these days now that Photobucket is dead? Doesn't look bad to me. To be honest with you I would not go looking for problems I can't see either, it can give you a complex! For the most part my Alienware one is fine, not perfect but good enough. I feel the same. Its not perfect, and yes if I fill the screen with black, turn off all the lights, and move my head around, then yes I can see glow/blb, but that's not a real world use, its there if I look for it, but in general use its fine, and the actual picture quality is amazing compared to my previous 1080p ultrawide. It looks 1000% better in reality too, phone photos always make these things look terrible. I think the screen technology means non of these screens are perfect, its just a sliding scale of how good/bad they are. Hm to be honest I would say that looks slightly worse than the one I have here, if I put this at 59 brightness. But then yours also looks better than most of the pics if you type in "X34P uniformity" etc. to google. Maybe I actually have a good one, and its just not possible to get these with perfect white uniformity. I also noticed that the lower the brightness, the worse it looks, higher brightness looks better. I will upload a photo of mine later. I don't think I even have a "bad" example here... quite possibly I have a relatively good one... but I still find the darkening on the right a bit irritating, compared to my old X34 which does not have that... But then the P is better in most other ways. 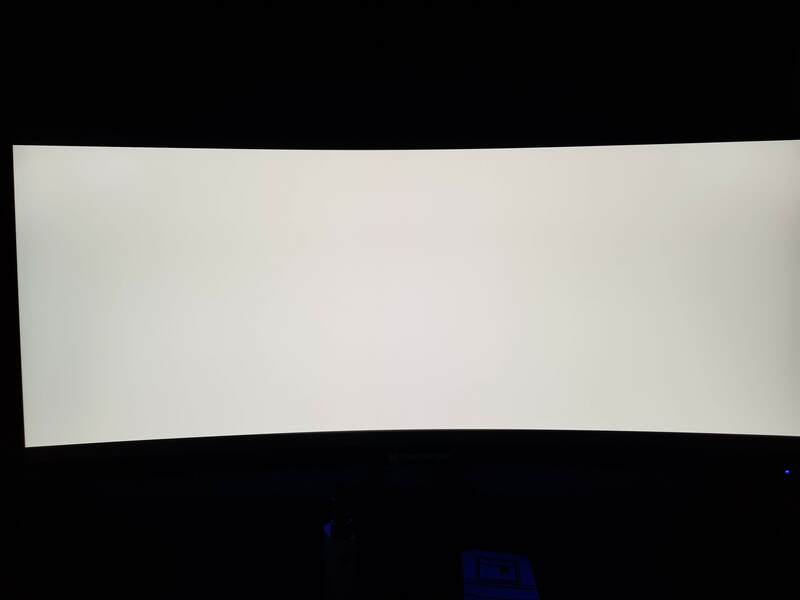 Anyone else who wants to post photos of a white screen, or also of OCUK forum page (or any dark solid colour), would be very useful. Post your pictures of a white screen and say the brightness. Instead of people saying "mine is bad look at it", I want to see the best possible on these monitors!! It won't be a fair test because different light levels, different cameras etc.